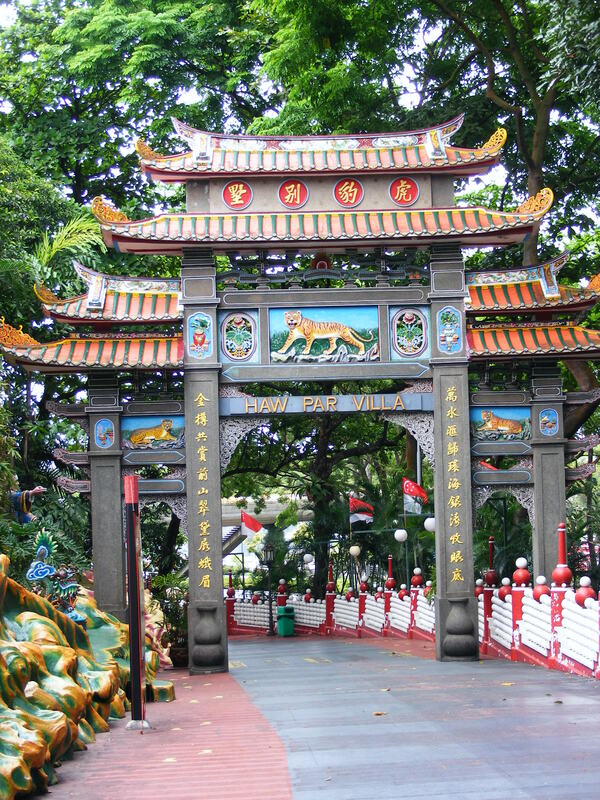 I mentioned in the last Off The Beaten Track installment that the Missies and I have started geo-caching, and the great thing about it is that it’s taken us to parts of Singapore that we normally wouldn’t visit or even have heard of. Who knew there were hidden capsules all around the world?? 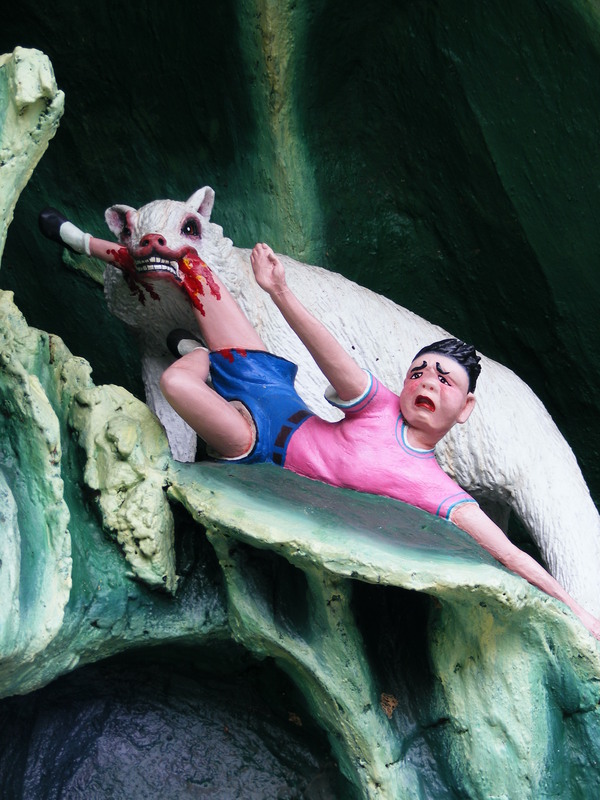 Haw Par Villa has been on my “must see” radar for a while, but it’s not on the usual tourist list of things to see and do in Singapore so when I saw there was a geo-cache there I finally had the motivation to visit. It calls itself a “theme park” but may be best described as a sculpture garden as there’s no thrill rides, which is what I generally associate with theme parks. 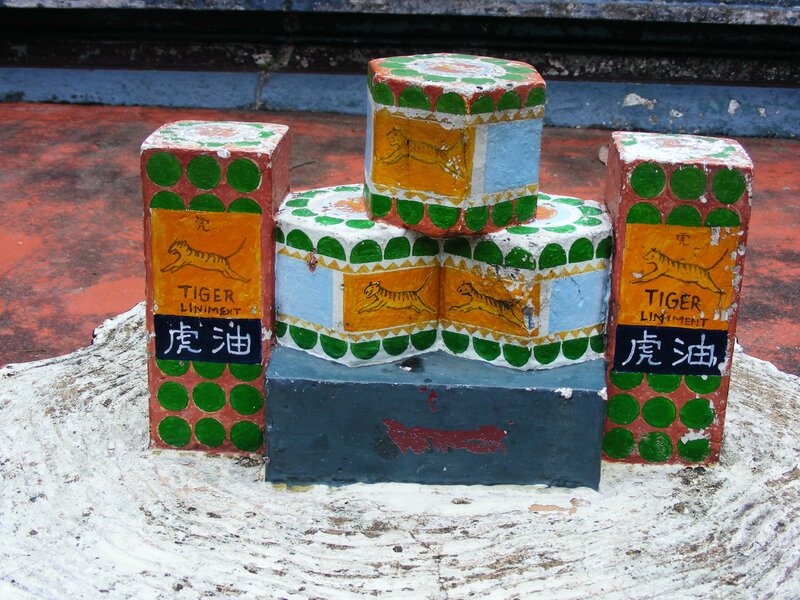 It was originally known as “Tiger Balm Gardens”, as it was founded by the brothers who first started selling Tiger Balm. 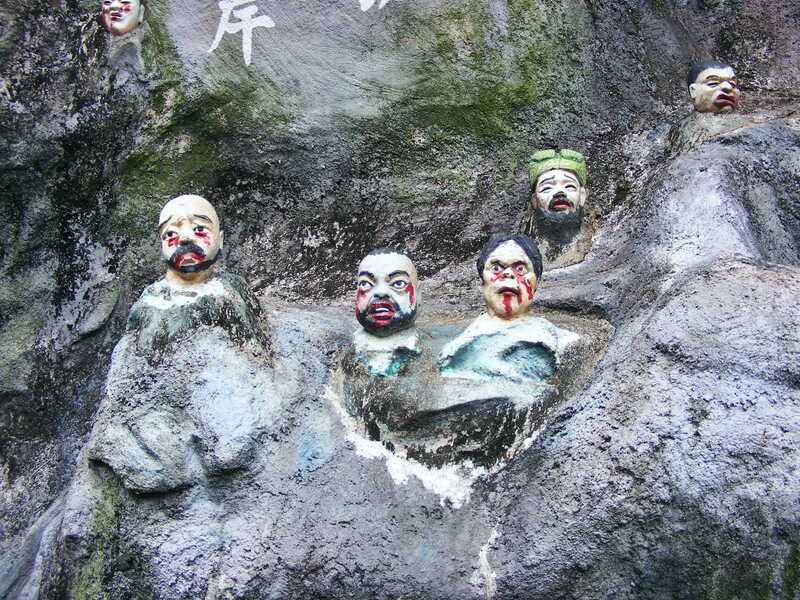 There’s around 1000 statues which all tell stories from Chinese mythology and folklore. There are information signs in Singapore’s 4 official languages in front of each diorama so that you can understand what’s happening. I’m going to be honest – this place is odd! But in a completely fascinating and kitschy kind of way. It’s so bad that it’s good! A lot of the exhibits are showing wear but there were teams painting some displays and others had obviously been painted recently. In this humid climate painting is a never-ending task! 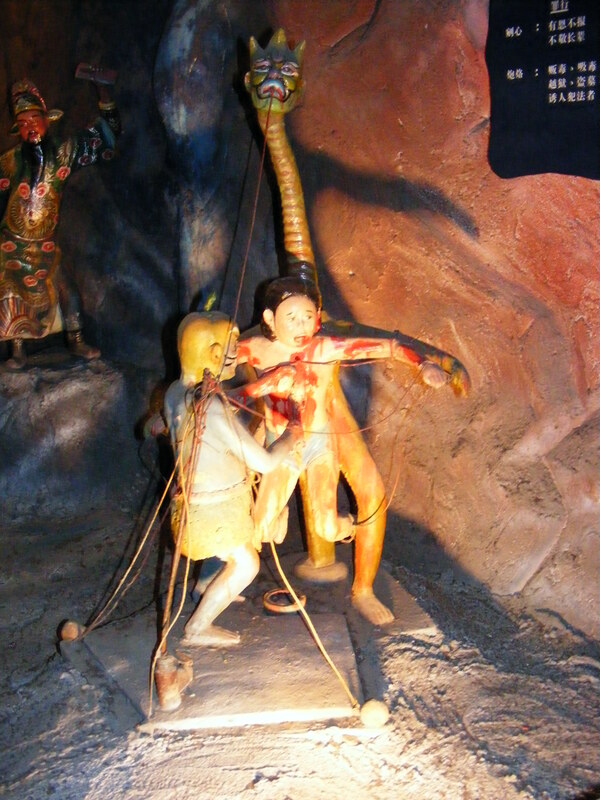 The prize exhibit is the Ten Courts of Hell. 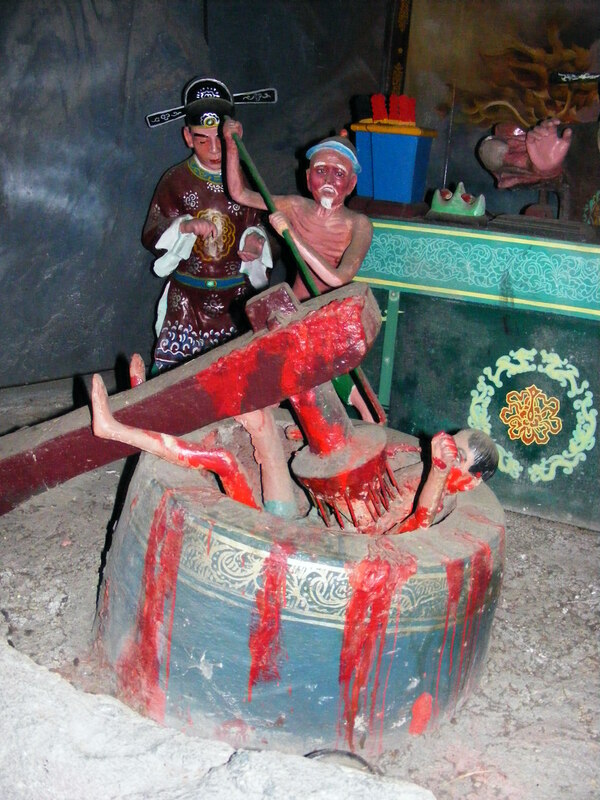 It’s pretty gruesome but no more so than the torture displays I’ve seen at Madame Tussaud’s and other Western tourist attractions. I didn’t have enough time to stop and read all the information but it was a quirky way to spend an hour or so. Freshly painted display. All the better to see the hyena type creature biting off the boy’s leg. 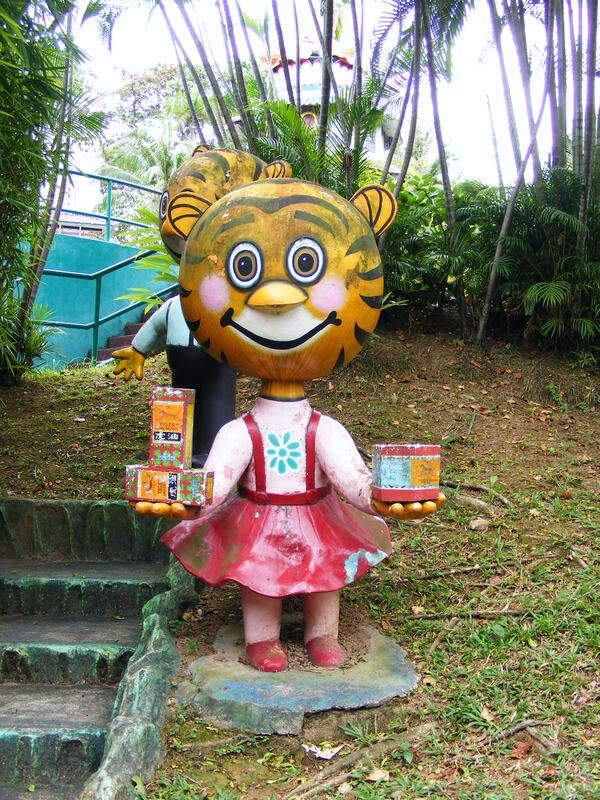 Mixed in with the macabre are cutesy characters that Asia seem to love. This one reminded me of the torture chamber at Madame Tussaud’s. Ten Courts of Hell. Not for kiddies. A woman breast-feeding her father-in-law. As you do. 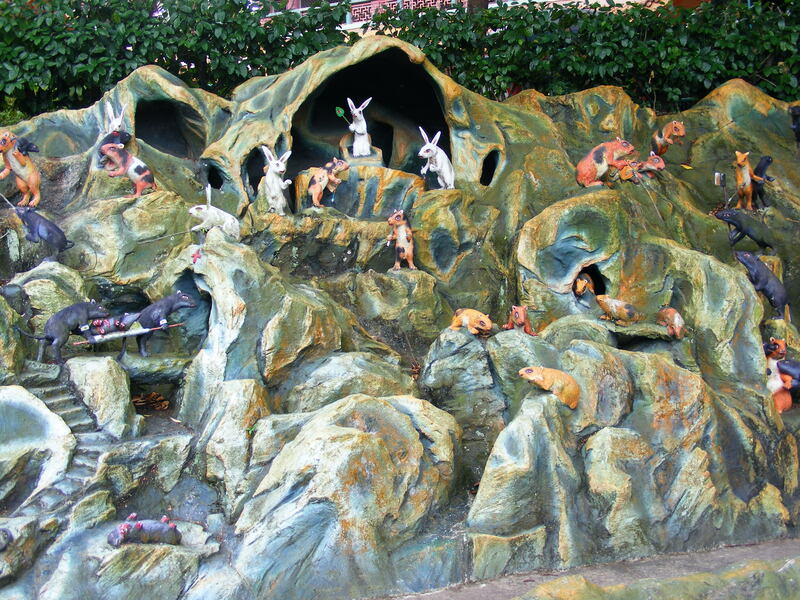 This is a bit Watership Down-ish. 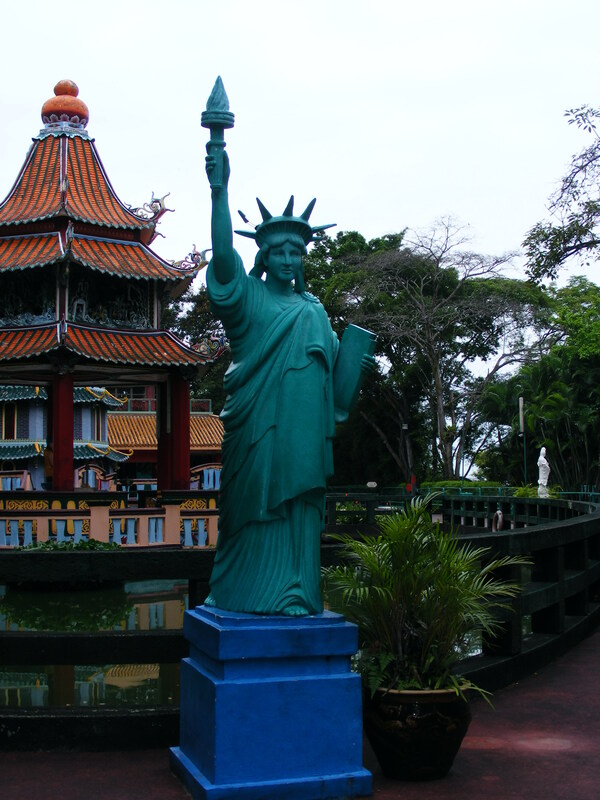 And the prize for the most out-of-place statue goes to The Statue of Liberty! 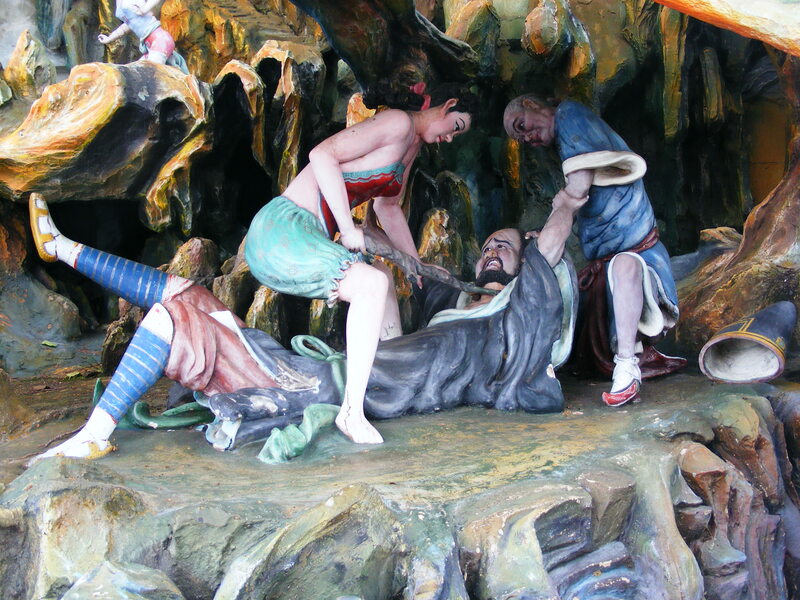 Haw Par Villa is at 262 Pasir Panjang Rd Singapore 118628. Admission is free but parking is $5. Opening hourse are between 9am and 7pm. 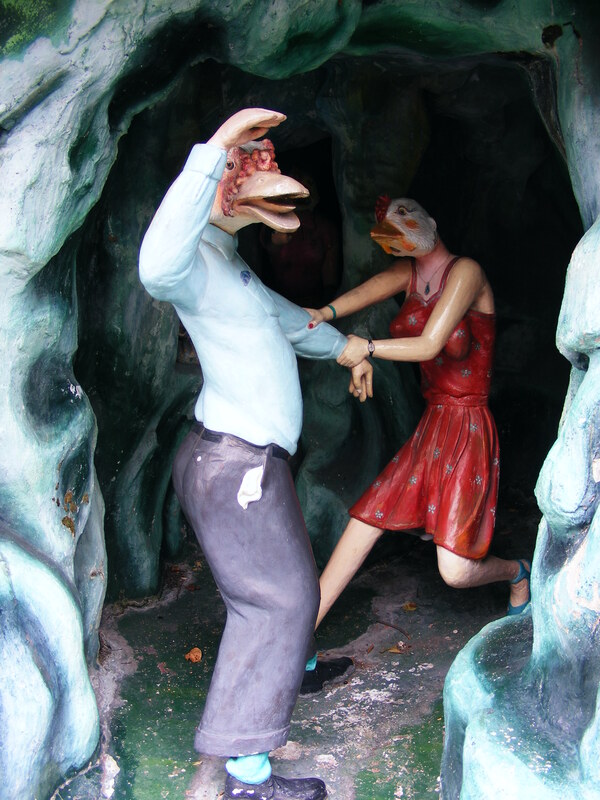 We really enjoyed this freakish place. We took tons of pictures and it looks like you did too. 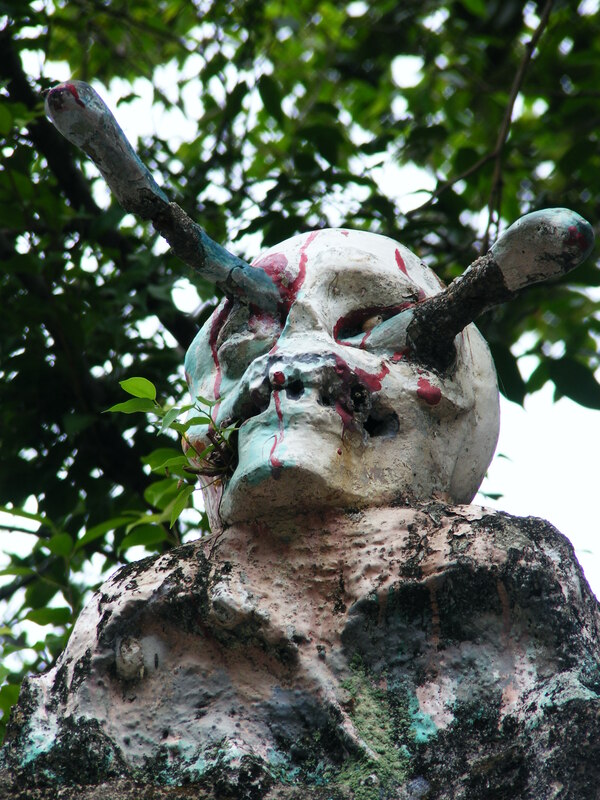 The Ten Courts of Hell was especially crazy!